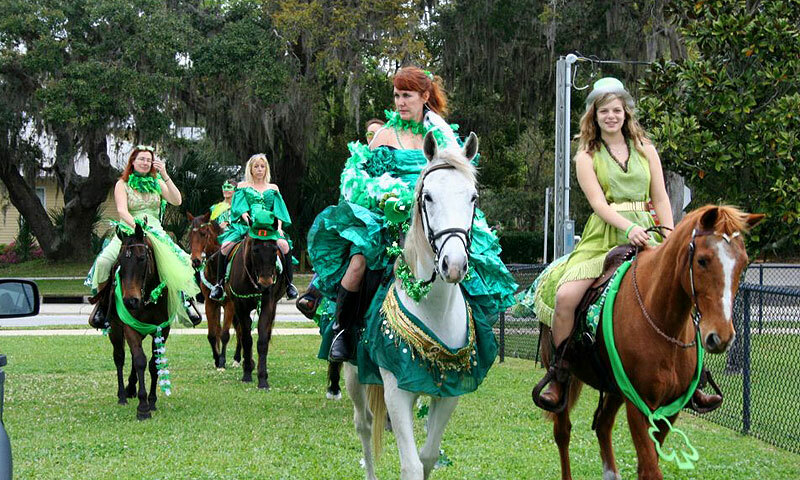 This three-day festival celebrates Celtic music, cuisine, culture, and heritage, and features the world's oldest St. Patrick's Day Parade. 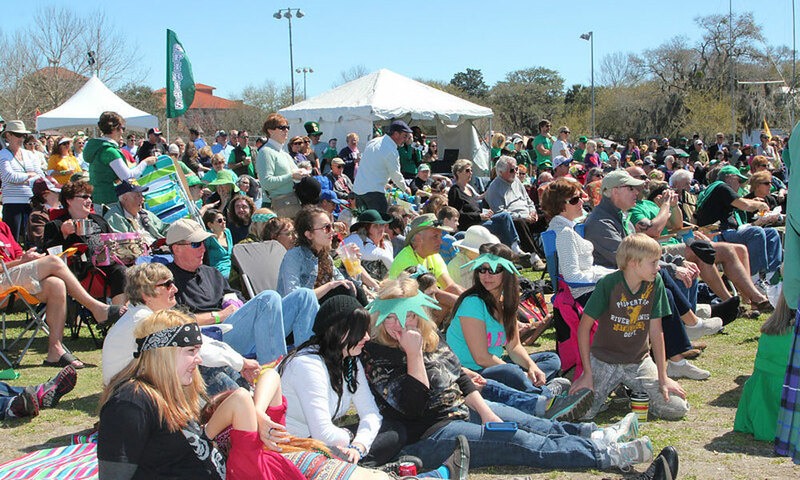 St. Augustine's popular annual Celtic Music and Heritage Festival will be held at Francis Field from Friday through Sunday, March 8 through 10, 2019. The Celtic Festival celebrates St. Patrick's Day and the sights, sounds and tastes of the ancient peoples of Scotland, Ireland, Wales, and other parts of Europe. 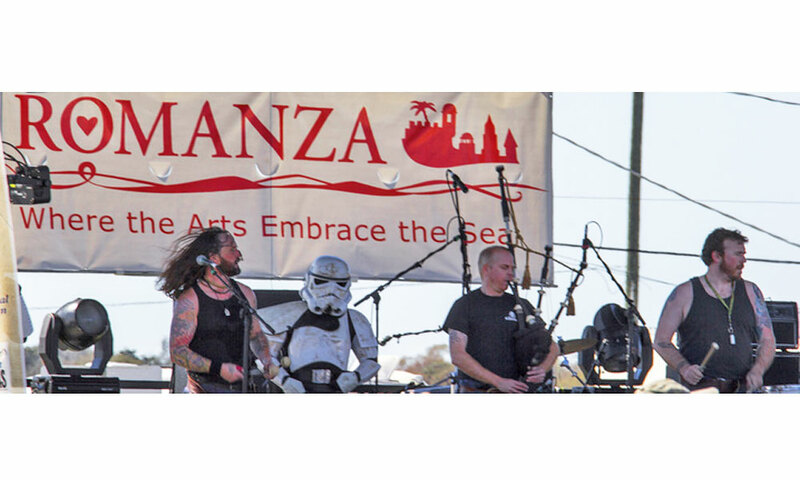 Celtic clans from around the world come to show their ancestral pride, athletes demonstrate their strength at the Highland Games, and Celtic folk music and rock rings out throughout the weekend. 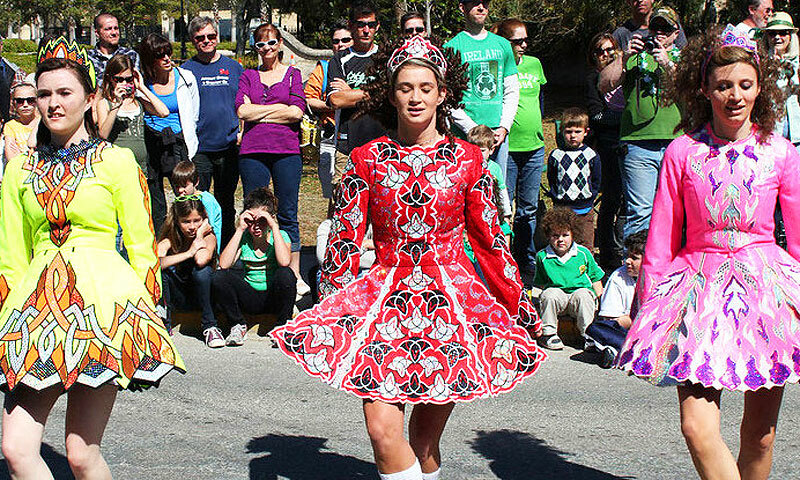 Vendors and local downtown restaurants offer up Celtic cuisine and handmade crafts, and the world's oldest St. Patrick's Day Parade marches through the streets of the nation's oldest city. St. Augustine's own Chad Light will serve as the Festival Emcee in 2019. Other entertainment throughout the weekend will include belly-dancing by the Blue Lotus World Dance Company (on Saturday only) and magic shows by the pirate Capt. Mayhem. Friday, March 8, 2019: Whiskey Tasting at 7:00 p.m. in the VIP Tent at Francis Field. The tasting event is $45 per person and features seven premium brands of Irish and Scotch whiskeys for visitors to sample. 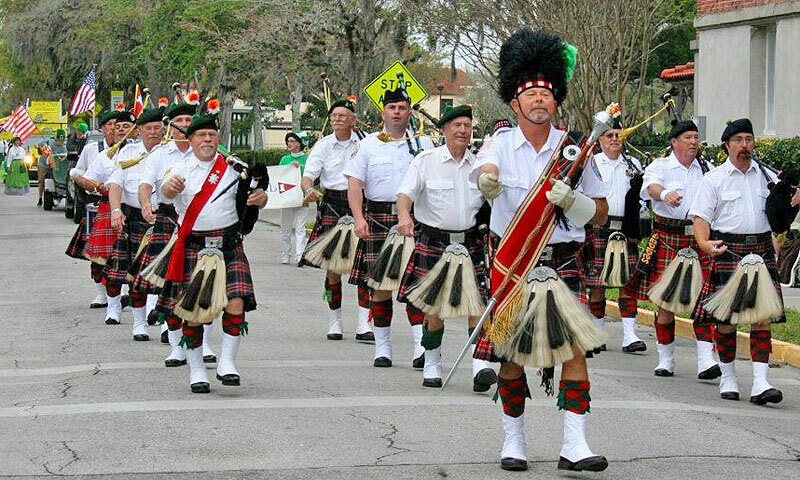 Saturday, March 9, 2019: The St. Patrick's Day Parade will take place on Saturday at 10:00 a.m. St. Augustine's St. Patrick's Day Parade is the oldest St. Patrick's Day Parade in the world (it first happened here in 1601) and the ONLY St. Patrick's Day Parade in Northeast Florida. Festival gates at Francis Field open at 11:00 a.m. after the parade and live entertainment begins at 12:00 p.m. Entertainment will be held on two stages. Sunday, March 10, 2019: Gates open at 10:00 a.m. and the festival ends at 7:00 p.m. Throughout the day, live entertainment will be on the main stage at Francis Field as well as on a secondary stage. Celtic Clans: Clans from throughout Scotland and Ireland will show off their family pride and represent their ancient heritage. That family's music, colors, language and stories will educate and entertain visitors. 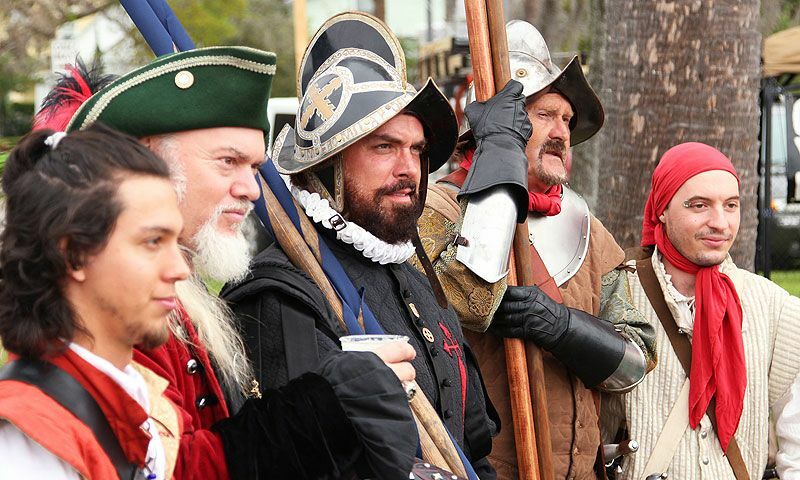 The Parade of Clans will take place at 10:30 a.m. on Sunday, March 10, 2019, and this year's Honored Clan will be Clan MacLaren. Highland Games: This Scottish tradition dates back to the King of Scots Malcolm III who summoned contestants to a race in order to find the fastest runner in the land to serve as royal messenger. The games have expanded to include piping, drumming, dancing and more. Visitors will see firsthand some of the talents that Gaelic culture has to offer. Music: Traditional and modern Celtic music will be performed by regional and national bands. Many of the headlining musicians are returning from earlier festivals, including fan favorites Dublin City Ramblers, Albannach, Seven Nations, Emmet Cahill and Poor Angus. Two new bands to the Festival this year are composed of talented sisters, The Gothard Sisters and Screaming Orphans. Each day features different bands on two stages. For a complete schedule of entertainment, see below or visit here. Admission: General Admission is $10, ticket is valid for either Saturday or Sunday. Children 12 and under are FREE. Retired and active duty military with I.D. are FREE. Visit here to purchase tickets. VIP tickets include admission for both days, free festival t-shirt, 2 free beers or wine, and separate VIP seating, bars, and bathrooms. Children who accompany a VIP adult are free. VIP tickets are $75 until February 28, 2019 and $85 thereafter. When: Friday through Sunday, March 8 - 10, 2019. Whiskey Tasting ... Friday, 7:00 to 9:00 p.m.
Saturday: Gates open at 10:00 a.m.
Sunday: Gates open at 10:00 a.m., close at 7:00 p.m.
Where: Francis Field is located at 25 W. Castillo Drive St. Augustine, FL 32084, behind the parking garage in downtown St. Augustine. These Celtic bands will perform on the main stage this year, many of them returning from earlier festivals. The full schedule of live entertainment can be found on the Festival website here. This band was born and bred in Scotland and plays authentic Scottish music. Albannach's music includes a championship winning piper, talented main drummer, bass drummers and bodhran musician bringing visitors a new style of energetic music. Emmet Cahill, formerly with the world-renowned Irish music show Celtic Thunder, has embarked on a solo career and will perform at the Celtic Festival on Sunday only. This band was voted Ireland's No. 1 Ballad and Folk Group of the Year by The Irish Country Music Association. They have played worldwide and continue to thrill audiences. This 35-year veteran band infuses their music with humor and wit to keep the performance exciting and has performed at every major venue in Ireland and abroad. They will perform on Saturday and Sunday. These three sisters play contemporary Celtic music and have been performing, writing, and touring together for ten years. Their most recent album, Midnight Sun, reached #6 on the Billboard World Music charts. Based in Ontario, this progressive Celtic group mixed exciting presentations of traditional Scottish, Irish, and East Coast pieces with more contemporary musicianship. The group was formed in 2005, and they appeal to both traditional purists and modern audiences equally. Another all-sister group, Screaming Orphans hails from Bundoran, County Donegal, Ireland. They are one of the most sought-after Celtic bands around, with a distinctive sound that combines their own melodic old-school pop songs with a uniquely modern take on traditional Irish music. The name refers to the seven original Celtic nations of Scotland, Ireland, Wales, Cornwall, Galicia, the Isle of Man and Brittany. The band got its start in 1993 in New York City with a standard line-up of drums, guitars, and bass, and have gained fame over the years with tours in Europe and Canada and performances on PBS and CNN. Seven Nations will perform on both Saturday and Sunday. With a sophisticated sound that is influenced by American styles, such as bluegrass, folk, and root music, as much as traditional Celtic music, Steel City Rovers are known for their emotive vocals and the amazing crafted replicas of historical instruments that they feature on their tours. This year, the Celtic Festival will be giving away 8 free ticket pairs to the highly-anticipated concert by Celtic Woman in Jacksonville on March 13. The winners will be drawn from advance-ticket sales for the Celtic Music & Heritage Festival purchased by February 28. Winners will be notified by email on March 1 and must confirm by March 5. Visit www.celticstaugustine.com for additional details. Parking is available at the downtown parking facility right next to Francis Field. On Saturday, March 9, 2019 only, a free Park & Ride Shuttle will be provided from 8:00 a.m. to 11:00 p.m. The shuttle service picks up from two parking locations: the St. Johns County Health Department (200 San Sebastian View), and the North San Marco Lot (301 San Marco Avenue). The shuttle will drop off at the Historic Downtown Parking Facility, which is located next to Francis Field (where this event will be held). For more details and maps for the Park & Ride Shuttle, visit here. For alternative parking options on other Festival days (March 8 and 10, 2019), please visit here.